For some time, scientists have known that the Moon and Mars have some fascinating similarities to Earth. In addition to being similar in composition, there is ample evidence that both bodies had active geological pasts. This includes stable lava tubes which are very similar to those that exist here on Earth. And in the future, these tubes could be an ideal location for outposts and colonies. However, before we can begin choosing where to settle, these locations need to be mapped out to determining which would be suitable for human habitation. 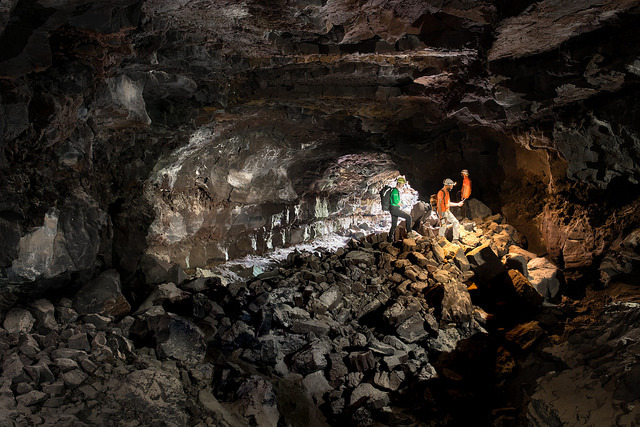 Luckily, a team of speleologists (cave specialists), geologists and ESA astronauts recently created the largest 3D image of a lava tube ever created. As part of the ESA's PANGAEA program, this technology could one day help scientists map out cave systems on the Moon and Mars. The lava tube in question was the La Cueva de Los Verdes, a famous tourist destination in Lanzarote, Spain. In addition to ESA astronaut Matthias Mauer, the team consisted of Tommaso Santagata (a speleologist from the University of Padova and the co-founder of the Virtual Geographic Agency), Umberto Del Vecchio and Marta Lazzaroni – a geologists and a masters student from the University of Padova, respectively. Last year, the team mapped the path of this cave system as part of the ESA's 2017 Pangaea-X campaign. As one of many ESA Spaceflight Analog field campaigns, the purpose of Pangaea-X is to conduct experiments designed to improve the future of the ESA's Planetary ANalogue Geological and Astrobiological Exercise for Astronauts (PANGAEA) training course. For five days in November 2017, this campaign mobilized 50 people, four space agencies and 18 organizations in five different locations. The La Cueva de los Verdes lava tube was of particular importance since it is one of the world's largest volcanic cave complexes, measuring roughly 8 kilometre (5 miles) in length. Some of these caves are even large enough to accommodate residential streets and houses. During the campaign, Mauer, Santagata, Vecchio and Lazzaroni relied on two instruments to map the lava tube in detail. These included the Pegasus Backpack, a wearable mapping solution that collects geometric data without a satellite and synchronizes images collected by five cameras and two 3D imaging laser profilers, and the Leica BLK360 – the smallest and lightest imaging scanner on the market. In less than three hours, the team managed to map all the contours of the lava tube. And while the results of the campaign continue to be analyzed, the team chose to use the data they obtained to produce a 3D visual of all the twists and turns of the lava tube. The scan that resulted covers a 1.3 kilometre (0.8 mile) section of the cave system with an unprecedented resolution of a few centimeters. Santagata and the Virtual Geography Agency also turned their 3D visual into a lovely video titled 'Lave tube fly-through', which beautifully illustrates the winding and organic nature of the lava tube system. Join us on a trip through a volcanic wormhole! This 3D scan of the 8 kilometre 'La Cueva de los Verdes' lava tube in Lanzarote, #Spain, was acquired during the @ESA_CAVES #Pangaea campaign. This video was posted to the ESA's twitter feed on Tuesday, March 13th (shown above). This video, like the scans that preceded it, represent a breakthrough in geological mapping and astronaut training. While lava tubes have been mapped since the 1970s, a clear view of this subterranean passage has remained elusive until now. Beyond being the first, the scans the team conducted could also help scientists to study the origins of the cave system, its peculiar formations, and assist local institutions in protecting the subterranean environment. As intended, the scans could also assist future space exploration and colonization efforts. For instance, the 8 kilometre lava tube has both dry and water-filled sections. In the six-kilometer dry section, the lava tube has natural openings (jameos), that are aligned along the top of the cave pathway. These formations are very similar to 'skylights' that have been observed on the Moon and Mars, which are holes in the surface that open into stable lava tubes. Such structures are considered to be a good place for building outposts and colonies since they are naturally shielded from radiation and micrometeorites. Lava tubes also have a constant temperature, therefore offering protection against environmental extremes, and could provide access to underground sources of water ice. Some sections could also be sealed off and pressurized to create a colony. As such, exploring such environments here on Earth is a good way to train astronauts to explore them on other bodies. As all astronauts know, mapping an environment is the first step in exploration, especially when you are looking for a place to establish a base camp. And in time, this information can be used to establish more permanent settlements, giving rise to eventual colonization.